Now that I have a larger kitchen (and a basement pantry, woohoo!) I decided I had the space to buy a new appliance. I love the concept of slow simmered soups, stews and sauces but lets be real, who has time for that? Not me. At least not until this pressure cooker came into my life. The concept of pressure cooking can be credited to a French physicist back in 1679, but at the time it was only seen as experimental. It took until 1919 for the first patent to be granted, and the appliance finally gained popularity among housewives at the World Trade Fair in New York in 1939. How does it work? By sealing the vessel and not allowing air or liquid to escape, the pressure inside increases as it heats. As the pressure increases, so does the boiling point of water thus allowing the liquid inside to rise to a much higher temperature. A higher temperature means food cooks faster. A lot faster from my recent experiences. 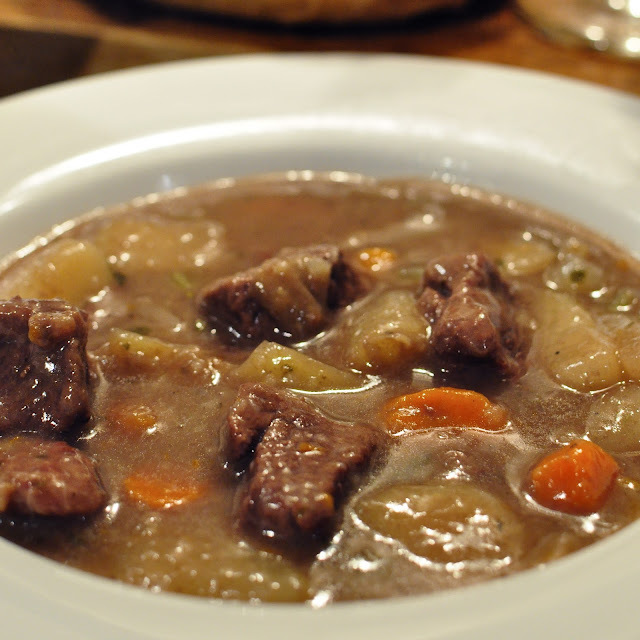 My first attempted recipe was beef stew. I've never made beef stew in my life. In fact, I have only eaten it a handful of times but somehow this seemed like the right choice for my new pressure cooker. I started by coating the beef with flour and browning it. There is a browning feature on the cooker, essentially turning the pot into a giant frying pan, and I've quickly learned that this is a must. Some meats need a sear on the outside to bring out the flavors, and doing it all in the same pot couldn't be easier. Next, I prepped veggies- onion, celery, and carrots. I set aside the beef, and cooked the veggies using the browning mode as well. 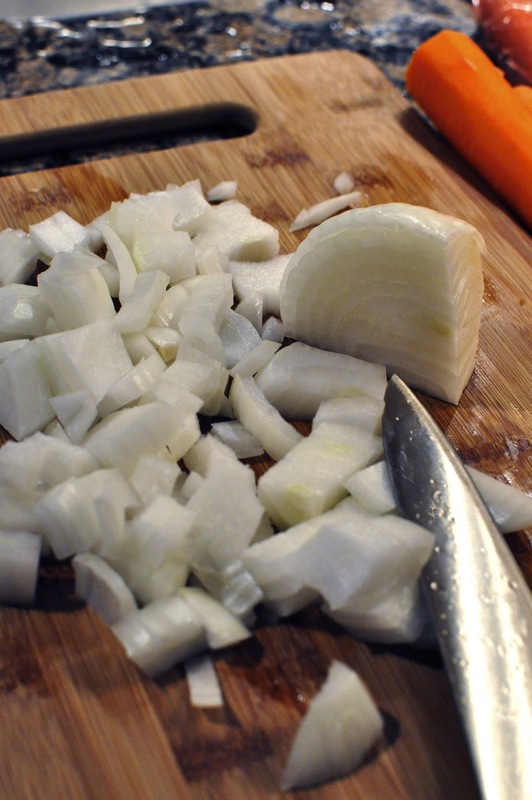 Onions are always better after a little sauteeing. Next I added the liquid. Pressure cooking absolutely requires liquid, but be aware that none of it evaporates so what you start with, you end with. In this case, I used red wine diluted with a small amount of water. Lastly, I added back the seared beef and some cut potatoes. I set the timer for 13 minutes. Just 13 minutes to cook stew? To cook potatoes? I was skeptical but since that was the recommendation, I found some faith and closed the lid. Thirteen minutes later, here is what I saw. It was cooked and I was shocked. I realized at this point that I started with too much liquid (nobody gave me the warning that just passed along), so I got out the corn starch and thickened 'er up. 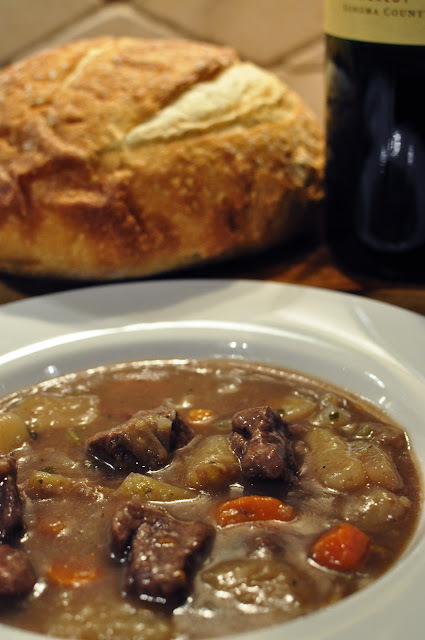 Served with a crusty bread and a bold red wine, this meal was perfect for a cold winter's night. Since my first attempt was such a success (if I do say so myself), I decided to see what other day long recipes I could cook in lighting speed. Next up was a Bolognese sauce. Bolognese refers to a meat based sauce originating in Bologna, Italy. I don't like eating too much red meat, so I substituted the customary ground beef with ground turkey. Shhhh, don't tell Captain McBlack. I started by browning the onions and ground turkey. Then I added some veggies and diced tomatoes. Meanwhile, I cooked up some linguine. By the time the pasta was ready, so was the sauce. Can't forget the parmesan cheese. How easy was that? From prep to eating within 30 minutes. Now that I had two great dishes under by belt, I had to try making soup. 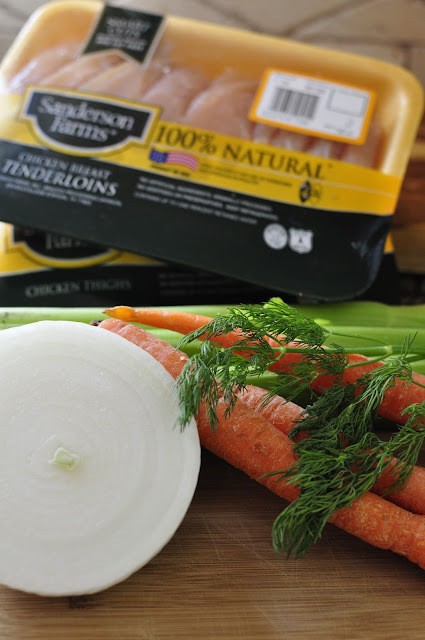 I absolutely love making chicken soup from scratch, but it is a full day commitment. 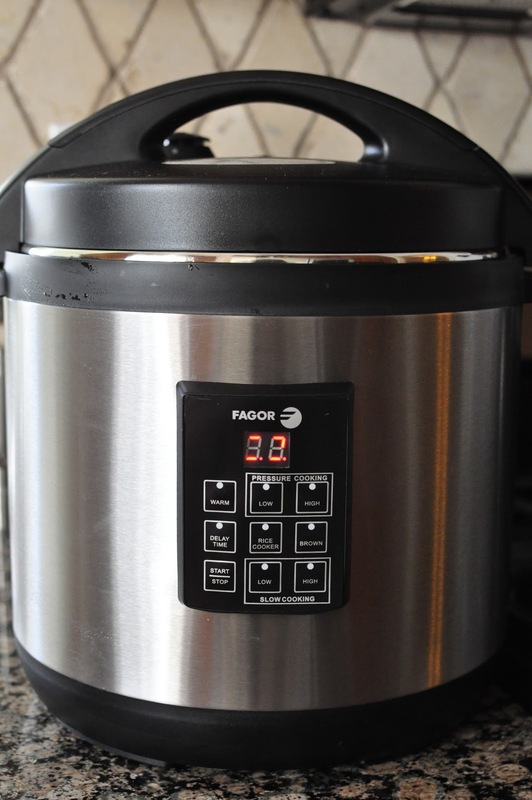 Lately, that just hasn't been possible but this pressure cooker is changing everything! I followed same technique I use when I make soup the traditional way, but each step was a fraction of the time. I started with the usual cast of characters (carrot, onions and celery) and added dill. Most people see dill as an unusual ingredient to add to chicken soup, but this is how my grandmothers made it and so this is how it shall be. Besides, it adds a wonderful complimentary flavor. There was no pre-cooking this time. I simply layered the vegetables and chicken, seasoned and covered with water. Twelve minutes later, the soup was cooked but not done. I removed the veggies and chicken from the pot and pulled the meat off the bones. At this point, it was so juicy and tender it simply fell off. I cut a fresh batch of vegetables and dill and added it back to the broth with some noodles. Since we weren't in a rush to eat I used the slow cooking setting instead of pressure cooking the soup to completion. The seal prevents evaporation, so during the few hours that I let it simmer the flavors had time to combine without any loss of liquid. It my opinion, that is a huge advantage versus cooking on the stove. The soup was a hit, and knowing that it can be done so quickly means that I can make it more frequently. I'll eat this over canned soup any day. After the ease of these three pressure cooked meals, I am wondering how I ever lived without my pressure cooker. I prefer to eat dishes that were prepared from scratch, and this will allow me to vastly expand my repertoire, with no pressure (ha, ha, pardon the pun). Hmmm...didn't I hear you could make desserts in this thing too? Congratulations on your new toy! Can't wait to see you making desserts, pasta and sauce TOGETHER and much, much more! I love your grandma's soup recipe, the dill is a nice touch!! Thanks for the encouragement. 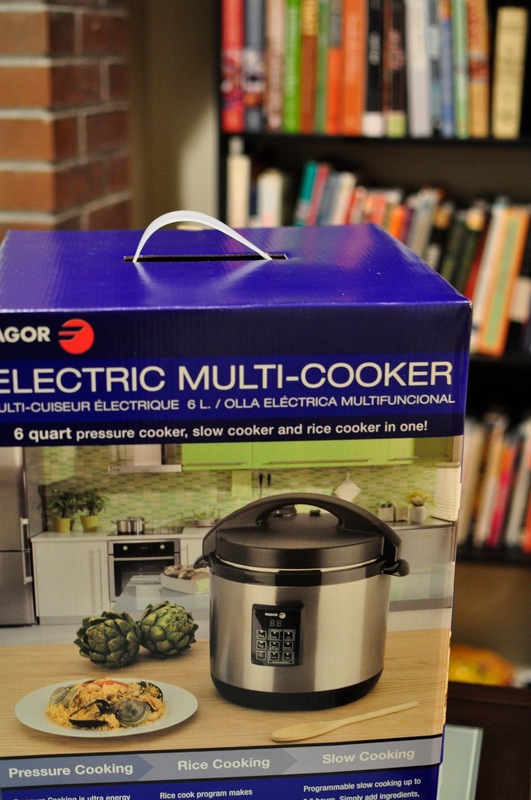 I checked out your blog and am full of inspiration for pressure cooking. Great recipes and gorgeous photos. Welcome to the wonderful world of pressure cooking. I have been teaching people how to use a pressure cooker for more than 15 years. It changed my cooking life and I, in turn, have helped others do the same. I am sure that you will have the same results based on this post. Your photos are wonderful. Keep up the good work. Thanks for the welcome. I just looked at your site and am very impressed. 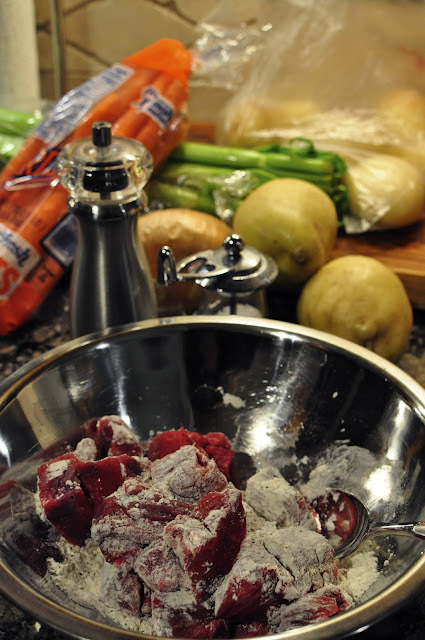 A dietitian, cook and freelance writer all in one...just what I am striving to be one day! I'm glad you found me. I'll be sure to follow your work and I look forward to your new cook book. Well. 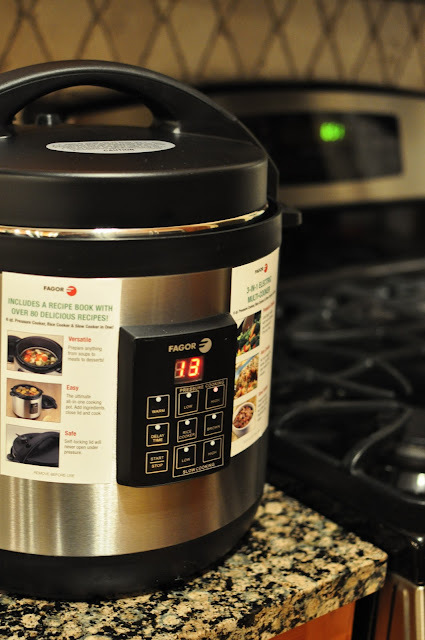 who knew that a pressure cooker could cook so quickly and remove the pressure of too little time. Loved the pictures of the fresh produce and of your stew, sauce and chicken soup. The grandmas would be proud!